Ah, the sights and sounds. Rocket jumps and railguns, even that grimacing marine, bringing me right back to those good ol’ days of Quake. Quake Champions may still be in the throes of open beta, but qualifiers for the 2017 World Championships are running throughout the day, where the modern Quake best compete to earn a shot at the $1 million prize pool in Dallas this summer. In one duel match, competitor Bryan “Baksteen” Reed landed a quick one-two punch with the railgun to take the round, including one assisted by a rocket jump (firing a rocket at your feet to boost yourself into the air). The duels in Champions are a little different from your classic Quake matches—each round is first-to-three, but players draw from a pool of champions who each have a unique skill, like the orb-teleport Reed uses near the start of the clip. Even so, rockets and railguns are still the order of the day, so Champions looks and sounds like Quake, even if a little Overwatch spilled over. They even kept the lil’ floating ammo boxes. 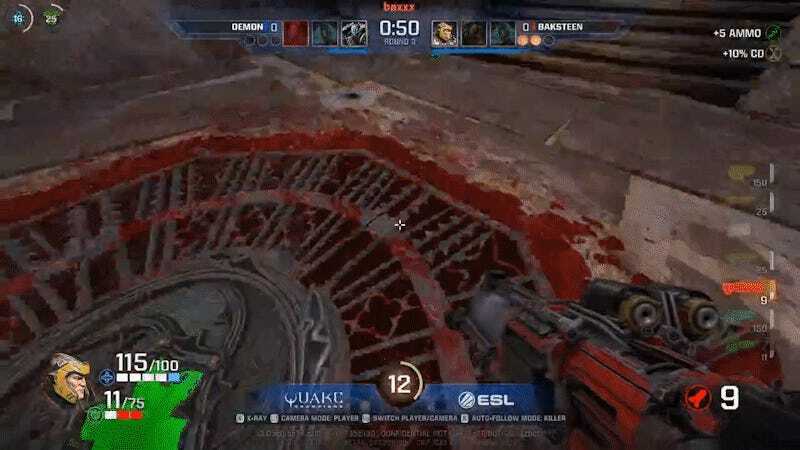 Matches are still running today on the Quake Champions official Twitch page, if you want to catch more fragging action and bunny hopping.